Taiwo Awoniyi scored in the 90th minute to give Royal Excel Mouscron a 2-1 win over Belgian League leaders Genk on Saturday. The Liverpool loanee out-muscled left-back Neto Borge to latch onto a hopeful pass into the channel, before running through on goal and calmly slotting beyond Nordin Jackers. Mouscron went ahead in the 17th minute when Mbaye Leye scored from the penalty spot after Awoniyi had been tripped in the box. 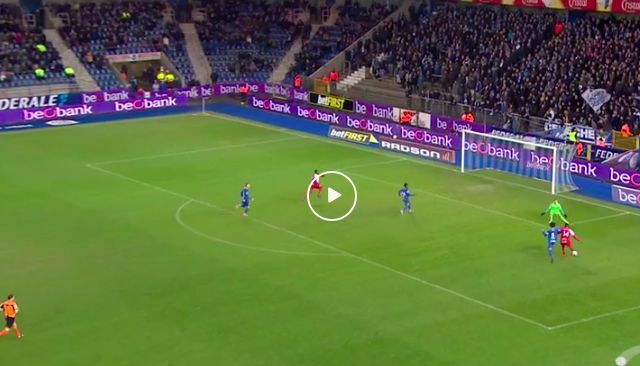 Genk then had to wait until the 73rd minute for an equaliser, with defending Sébastien Dewaest meeting a corner to tap home from close range. Awoniyi snatched the points in the final moments to take his record to two goals in his first two games since returning to the club on loan. The 21-year-old re-signed for Mouscron earlier in January after seeing his loan deal with fellow Belgian outfit Gent cut short. Issues with gaining a work permit mean Awoniyi is yet to make an appearance for the Reds since signing from Imperial Soccer Academy back in 2015. He has already experienced spells with 2. Bundesliga side FSV Frankfurt and Dutch club NEC, as well as making 31 appearances and scoring 10 goals in his first stint with Mouscron in 2017/2018. The striker was rewarded with a new long-term contract upon his brief return to Merseyside last summer.